Scott Morrison and Peter Dutton have again blamed the Muslim community and spread fear and racism following the violent attack in Melbourne’s Bourke Street last Friday. Thirty year old Hassan Khalif Shire Ali ignited a ute on Melbourne’s major thoroughfare. He then stabbed three bystanders, killing cafe owner Sisto Malaspina, before being shot dead by police. 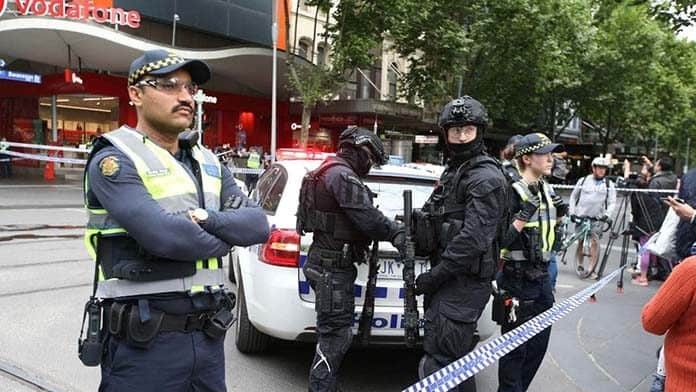 Morrison called Shire Ali a “violent, extremist Islamic terrorist” and Victoria police have similarly treated the attack as a “terror incident”. While Islamic State claimed responsibility for the attack, acting deputy commissioner for national security Ian McCartney explicitly stated there was no evidence of “direct contact” between Shire Ali and Islamic State. “Hasan suffered from mental illness for years and refused help”. “He’s been deteriorating these past few months. He has seen a psychologist and psychiatrist, but stopped as his paranoia and hallucinations led him to believe they’re ‘after him’. Others gave similar accounts. Imam Isse Musse, a friend of Ali’s family, said that he was, “complaining he was being chased by unseen people with spears,” and there were suspicions the delusions may have been caused by substance abuse. Yet Scott Morrison is determined to whip up fear, dismissing accounts of his mental health problems as “excuses”, saying the “real issue” is “radical, violent, extremist Islam”. Scott Morrison has tried to twist horror and outrage about the attack into a racist backlash against Muslims. This is a desperate attempt to salvage his failing government. He has blamed the Muslim community for the attack, saying “more needs to happen” from within the community to deal with the threat and “there can be no excuses for looking [the other way]”. Peter Dutton is also pushing for more spying powers that would allow access to encrypted messages and promising to ramp up deportations of terror suspects who are dual citizens or visa holders. But Islamophobia and more draconian laws only make things worse. The terror laws undermine democratic rights and increase racism by targeting Muslims. In August University of NSW student Mohamed Kamer Nilar Nizamdeen was arrested and locked up in Goulburn Supermax prison for four weeks. He was charged with terror offences only to be released when police were forced to admit that they had no real evidence against him. Shire Ali grew up in Australia, arriving here when he was just five years old. It was his experiences here that led to him carrying out the horrific attack. Scott Morrison has tried to blame terrorism simply on the “dangerous teachings and ideologies” of “radical extremist Islam”. But it is the experience of racism and social exclusion at home and witnessing the horrors of Western foreign policy in the Middle East that are the real drivers of “radicalisation”. Somalis and migrants of African descent face a torrent of racism from the media, police and politicians. The Liberals are fighting the Victorian election entirely on a law and order platform against a backdrop of racist hysteria about “African gangs”. Racism creates misery and alienation and traps people in poverty. Journalist Ralph Johnstone interviewed Somalis in Melbourne about their experiences. He described how, “Two experienced accountants told me separately of attending interviews for professional positions in Melbourne, only to be offered jobs as drivers.” Unemployment among Somalis in Victoria was 24.5 per cent according to the 2016 census. This kind of misery often leads to crime and substance abuse. According to Victorian Police Commissioner Graham Ashton Ali had a history of “minor drug, theft and driving offences”. Western imperialist policies in the Middle East have also generated devastation and anger. The US led war in Iraq resulted in one million deaths and destroyed the country. Before the invasion Islamic State didn’t exist. But it grew and thrived in the carnage. Saudi Arabia is also a notorious backer of extremist groups, but the West arms the Saudis to the teeth. In October the Department of Defence admitted it had made 14 approvals of military gear and services to Saudi Arabia in the past two years. Morrison can’t be allowed to exploit this tragedy—his racism must be pushed back. It is a heartening sign that Labor MP Anne Aly, the Australian National Imams Council and other Muslim organisations have publicly challenged Morrison’s racist scapegoating. Another important response was the Stand Together Against Racism protest in Melbourne, which took place the day after the attack. Around 500 marched through the streets of Melbourne to oppose the anti-African racism that has escalated in the lead up to the state elections. There was a strong showing from the Greens, the ALP and contingents from a number of unions. Despite racism being pushed to fever pitch in the wake of the attack, by the likes of Victorian Liberal leader, Matthew Guy, the strength and unity of the anti-racist rally shows how it can be fought. As one placard read: Black and white unite and fight, smash the racists, smash the right.